Gather round, new gardeners, for I am about to spill the beans on some principles of vegetable gardening that will help you in your own first attempts at growing a little food for yourself. I know, the word "principles" sounds highfalutin and uppity-do-da-day. But bear with and you'll see that these principles are pretty simple, pretty easy, and pretty much intended to help guide any gardener to a life of happiness and good vegetables. Yes, a life of happiness and good vegetables. Once you know these principles, you won't lose your mind reading seed catalogs, trying to decide what to grow. You won't fail miserably at growing vegetables. You won't give up hope during the hottest days of the summer. Put these five principles of vegetable gardening to work and you will soon be eating your own homegrown vegetables. Here are my five principles of vegetable gardening. 1. Never reach for a chemical pesticide to solve a bug, weed, or disease problem in your vegetable garden. Commit to finding natural solutions to your bug, weed, or disease problems. I always tell people you can buy pesticide-laden vegetables at the grocery store, so grow your own vegetables using organic methods. But you say you don't know the organic methods. Let me google that for you! Within seconds you can do an online search about nearly any vegetable garden pest and find ways to control it without reaching for a spray, dust, or other chemical concoction. 2. Build up your soil. Add organic matter, side dress with good compost, use good organic fertilizers. If you pay as much attention to building up the soil in the garden as you do tending the vegetables, your vegetables will practically grow themselves. Not convinced that soil makes a difference? Look up the Symphony of the Soil documentary and get a copy of it to view yourself. After viewing that, you may grow vegetables just to get the makings for good compost to enrich the soil. 3. Grow what you like to eat. But remember what you like to eat may change when you grow the vegetables yourself. If you don't like a particular vegetable, commit to growing it at least once and trying it again. You may find you like it when you grow it yourself. Over time, you'll figure out your tried and true varieties of vegetables to grow. I recommend you grow those each year, but also try at least one new variety and one new vegetable each year. One of the new vegetables may be your greatest triumph of the growing season and earn a place on your "tried and true" list. 4. Make the garden only as large as you think you can tend on your own. 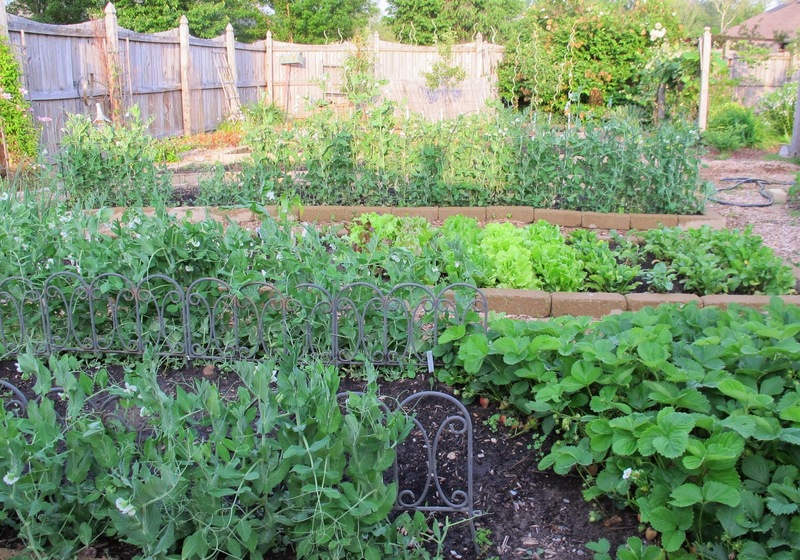 Generally, in most families, it falls to one person to tend the vegetable garden, so don't make the garden so large that it gets away from you by mid-summer and becomes a big weedy mess. And even if the garden becomes a big weedy mess by mid-summer don't give up on it. Spend a morning or two reigning it back in by weeding it and pulling out spent plants. You'll be surprised how the vegetable plants that are left respond and grow and produce for you. 5. Don't worry about what could go wrong in the garden, remember what can go right. So what if your spacing is a little off or you are a week or two late in planting? Or you don't pull every weed? Fortunately, a vegetable garden doesn't require perfection to produce food. You'll still get some good food for your efforts. And a bonus sixth principle for growing vegetables. 6. Visit your garden daily. The more time you spend in your garden, even if it is just five minutes early in the morning, the more you learn about it. You can catch problems early on, before they take hold and destroy an entire crop. And more importantly, you can harvest vegetables at their peak and enjoy some of the best food you've ever eaten. Trust me. Adopt these principles of vegetable gardening, and you'll enjoy a life of happiness and good vegetables. Yes, happiness and good vegetables. With the exception of grow what you like to eat, all of those principles apply to ornamental gardening as well. Thank you for sharing. I really like number 4. It's a good point and spending a morning getting it back together. I can wait to get started! I like the bonus #6. And for me it is a good reminder. I like point number 2 - it's a good reminder that gardening is about taking care of your soil as much as it is about keeping the veggies healthy. Do you have any detailed post on building up soil? Good tips. It seems a long way off. The ground is frozen and the plus is there are no bugs here right now. Those are all excellent points, and another one I have started recently is to leave no patch bare! I was ending up with lots of unused seeds, but now whenever I see a bare patch I pop in a seed. that patch is either going to grow a weed or something useful. I love growing my own vegetables in my garden. My favourites are carrots, lettuce and sweet peas. The problem is much of it is eaten by deer in the late summer. Anyway, I don@t give up! This year I think of increasing my veggie garden. I have put garlic to grow this autumn, and I hope to have my own garlic ready in august.